Hundreds of years ago, an advanced, seafaring civilization called Rapa Nui built more than 800 monuments that were so massive and ambiguous that they remain a mystery to this day. The Easter Island statues, or moai, are enormous stone figures placed along the coastline as if surveying the island's interior lands. One of archaeology's greatest mysteries is what happened to the Rapa Nui of Easter Island. Now, new evidence from archaeological investigations has overturned a popular myth about the demise of the Rapa Nui civilization on the island. For centuries, observers believed that the Rapa Nui suffered a catastrophic population crash. But there is no scientific evidence to support this idea, say a group of researchers in the latest issue of the journal Antiquity. That story about environmental collapse and warfare you read about in Jared Diamond's bestseller Collapse? Totally wrong. First of all, the Rapa Nui haven't been wiped off the face of the Earth: the Rapa Nui people still make up over half the Polynesian population today. Their ancestors likely arrived on Easter Island, now part of Chile, roughly a millennium ago. They came in the sophisticated canoes that allowed Polynesians to bring their cultures to dozens of islands in the Pacific Ocean, from Hawaii to Samoa and New Zealand. And they also brought their moai, many of which were quarried on other islands that the Rapa Nui controlled. When the Dutch captain Jacob Roggeveen arrives on the island in 1722, he estimates roughly 3000 people. Later, when confronted by the massive statues, Europeans such as Captain Cook in 1774 assume that there must have been lots more people on the island at one time. Others follow the same kind of argument, including Jared Diamond. He (and others) argue that there must have been 10,000 or 20,000 (or 30,000!) people, not because of the archaeological record or any direct evidence of demography but from the assumption that the statues must have required huge populations. This assumption gave rise to a mystery. What had decimated the great civilization of Easter Island? Why were there so few of the Rapa Nui left? The most common answer, popularized by Diamond, was that the Rapa Nui had greedily used up all the island's resources. They ate all the food, cut down all the trees, and were left to squabble over the remaining scraps. With no more trees left, they couldn't build boats to leave the island and look for more food. So they fell into war and cannibalism, leaving only a few thousand people left to greet the Europeans. It's a perfect parable for our age of environmental collapse and resource depletion. Unfortunately, like a lot of parables, it isn't very historically accurate. Lipo and his colleagues have spent years sifting through the physical evidence left behind on Easter Island by the ancient Rapa Nui. They believe that the population of 3,000 people met by Captain Roggeveen in 1722 wasn't the tattered remnant of a great civilization. Instead, they represented a normal population for the island. Lipo and other archaeologists have demonstrated how the moai could have been constructed by a population of hundreds rather than thousands, using clever engineering that was common among ancient people. Assuming a smaller population, it's not difficult to imagine that the group could survive on agriculture and fishing. Indeed, Roggeveen reports that the people he met on the island had plenty of food, which they shared with him and his crew. There was no sign of ecological meltdown, though the islanders certainly had an impact on the local environment. Still, there was one piece of evidence that remained pretty alarming. The island is strewn with sharpened pieces of obsidian, called mata'a, which look alarmingly like spearheads. When Captain Cook came to the island in 1774, members of his expedition reported that the Rapa Nui "had lances or spears made of thin, ill-shaped sticks, and pointed with a sharp triangular piece of black glassy lava." Given the superabundance of these "spears" all across the island, it seems obvious that a lot of murdering was going on. That's the myth that Lipo and his colleagues debunk in their new paper. They examined hundreds of mata'a, carefully photographing them and using elliptical Fourier analysis to compare the shapes of each mata'a. If these mata'a were being used for one specific task, namely war, you would expect that they would all have almost exactly the same shape. And you'd expect that shape to be extremely pointed in order to pierce flesh. 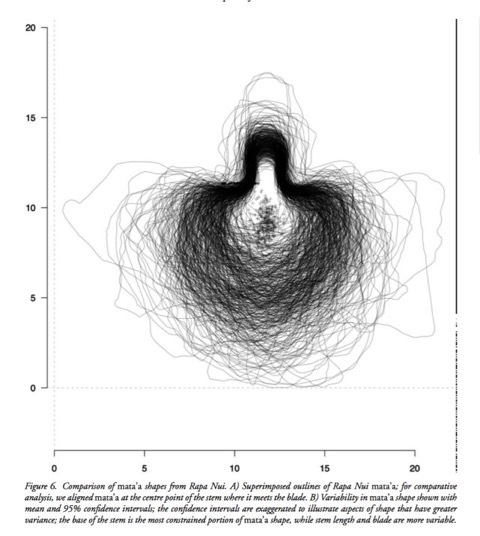 Here you can see the outlines of all the mata'a that the researchers analyzed. The stem is connected to the sticks and therefore tends to be uniform in shape, but the blades themselves came in a wide variety of shapes and sizes. The researchers call them the "swiss army knives" of stone tools. Lipo and colleagues found nothing of the kind. In fact, the mata'a come in a range of shapes, and most of them would be terrible for stabbing. Shaped a bit like spades, they're generally too wide to sink deeply into flesh. Wear and tear on many of the blades revealed patterns that archaeologists recognize as coming from tasks like scraping hide and farming. All those mata'a left in the ground weren't the aftermath of battle—they were discarded hoes and rakes. But why did the population shrink after the Europeans arrived in the eighteenth century? Lipo has a single, stark answer: "Disease that is introduced by Europeans after contact." Smallpox and plague ripped through Easter Island, halving the population in a short time. This crash, whose results were observed by Europeans, strengthened the myth that the Rapa Nui were already in decline from a much larger population that had existed a thousand years before. It's time to chuck our myths about Easter Island and learn what we can from scientific evidence. "I think we often assume that systematic violence between groups is inevitable, and in cases where resources are scarce (such as Easter Island) warfare is going to be almost a certainty. We tend to assume that prehistoric populations must have commonly experienced brutal competition," Lipo told Ars. "But when we look more broadly at human history, we find generally that we are pretty good at living in social groups and getting along with one another." 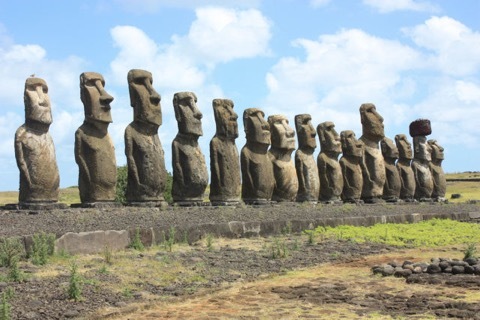 Easter Island is a great case of this kind of sociality in which populations seem to have mediated competition over limited resources through the community building of statues. What looks like strange behavior to us is likely central to their success. This is an area we are following up on in our ongoing research. I think we have a lot to learn from Easter Island as to what it takes to survive on an isolated and remote island with limited resources. But rather than being a "scary parable" about the effects of cultural hubris and ultimate collapse, we can learn valuable insights into strategies that lead to cooperation, resilience, and sustainability.